Note: This piece contains specific plot details about the A Star Is Born movies. Another A Star Is Born opened this past weekend, marking the fourth cinematic version of this particular title, making it a tale more covered by Hollywood than even King Kong. The template remains solid across all the versions: Janet Gaynor and Fredric March as Esther and Norman in 1937, Judy Garland and James Mason as Esther and Norman in 1954, Barbra Streisand and Kris Kristofferson as Esther and John Norman in 1976, and Bradley Cooper and Lady Gaga as Jackson and Ally in 2018. A troubled star on his way down falls in love with an ambitious star on her way up. With his help, her fame soon eclipses his. He can’t handle her stardom and his failure. But she stands resolute in the end, stronger for having known him. Still, what is it about A Star Is Born that has made it resonate for movie audiences across the past 80 years? There’s a lot to parse out here: On the woman’s side, it’s a Cinderella story with a fairy godmother you actually get to marry. For the men, there’s a bit of that attractive Pygmalion factor. There’s also some Frankenstein in the mix—not that Esther ever becomes a monster (although Ally leans that way briefly in the 2018 version), but that Norman self-destructs in part because of the success of his own creation. A Star Is Born also has the advantage of pulling the curtain behind the glamorous worlds of movies and music, starting in a pre-La La Land era when the first Star Is Born almost wasn’t given a go-ahead, as Hollywood pictures didn’t usually do that well. (That movie even starts and ends with shots of the screenplay.) So the movie also works as a cautionary tale about the poison inherent in these footlights and spotlights—not that that’s going to stop the Esther Blodgetts of the world one bit. When we meet the first Esther Blodgett—Janet Gaynor in the 1937 version—she’s a starstruck North Dakota farm girl dreaming of a glamorous Hollywood life. Unlike the ones who came after her, our only non-singing female star of A Star Is Born has no experience or established talent that would enable her belief that she is destined to have her name in lights. But she believes it, nonetheless, even after being cautioned by a studio secretary that her chances are one in a hundred thousand. Gaynor is such a winning actress herself—as evidenced by her own 1929 Oscar, the very first Academy Award for Best Actress—that we are soon firmly on her side, as she imitates various famous actresses of the day while waitressing at a party, or tries out her one line in a picture in a variety of accents and deliveries. It’s no wonder that Fredric March’s Norman Maine is a goner. March sets the bar for future Normans by being suave and debonair when sober, and a nightmare monster version of himself when not. The magnetic appeal of the two stars—Gaynor’s winsomeness and March’s sophistication—makes it logical for the mentor relationship to slide into romance, even as Esther becomes more saintlike the worse Norman gets. The film also sets a precedent for A Star Is Born’s tragic denouement, ultimately ending with Norman’s drowning in Malibu, followed by an inspiring pep talk to knock Esther out of mourning, and one of the greatest last lines in all of cinema, as the now widowed Esther greets her fans for the first time after her husband’s death: “Hello everybody. This is Mrs. Norman Maine.” It apparently took a while for the screenwriters to come up with that particular tear-inducing greeting, and it functions as a perfect final moment. The 1954 version of A Star Is Born is considered the standout, primarily due to a best-ever performance by singing legend Judy Garland. Garland had played Gaynor’s part on the Lux Radio Theater in 1942, with Walter Pidgeon as Norman. So she was familiar with the role, but her later version gives us a much glossier version of Technicolor Hollywood. As her Esther struggles with her Norman, Garland goes all in on her vaunted vulnerability to portray a loving wife helpless to help her husband. Gaynor and Gaga charm our attention out of us; Streisand demands it; but Garland straight-up earns it. Garland’s achingly emotional performance only stands out more in the sea of the movie’s extravagant musical numbers—although her co-star Mason was right when he noted that the 15-minute “Born In A Trunk” sequence breaks the film’s momentum, and could have been shaved down some. To his credit, Mason is our most unabashedly emotional Norman-type character until Bradley Cooper’s Jackson, sobbing when he falls off the wagon for what turns out to be the final time, or when he realizes that he’s going to end his life to save his wife’s career. March’s journey into the ocean is a stoic death march; Mason’s heartbreaking final scene in the same setting depicts a terrified man who feels he has no other options. Garland’s own best moment, in a nearly three-hour film filled with memorable moments, is her version of the “working Esther comes home exhausted to idle, homebound Norman” segment, which appears in some form in all four movies. She is so determined to entertain her docile husband that she effectively mimics a giant Warner Bros. musical extravaganza right in their living room, wearing only tights and a button-down shirt. She extracts enjoyment out of him—like she does to us all—sending us to different countries by using a floor lamp and a projector to mimic a studio set, while her husband crows delightedly. But as she’s trying to incorporate her husband into her life, he then rattles off a series of phone messages, feeling himself diminished to being her answering service. The loveliness of the couple’s reunion is wiped out by Norman’s first relapse as Esther feebly protests behind him. Those few minutes onscreen exemplify how Garland gave us so much of herself, like few performers do—which is why she’s still an icon, over half a century later. Groucho Marx rightly called Garland’s Best Actress Oscar loss for this performance to Grace Kelly’s shrewish The Country Girl “the greatest robbery since Brink’s.” (It’s speculated that only six votes separated the two.) Garland was so devastated by the loss, she didn’t make another movie for the rest of the decade, retreating to the enveloping affection of her concert audiences. It’s surprising, then, that the 1976 A Star Is Born, which shifts from movies to music, starts out with a destructive Norman concert, not a plucky Esther audition. Kristofferson’s John Norman snorts up and drinks before the show, forgets the words to familiar songs, and gets into a fight with an extremely large audience. He then heads out to a small club where he spies Esther’s naturally life-changing set (just like how Jackson meets Ally in 2018), and gets into another fight. Like the ones who came before her, Streisand’s energetic, super-confident Esther appears to be flawless except for her love for a guy who’s on his way down. Her stardom is atmospheric, taking off like a rocket after John (again, like Cooper’s Jackson) hands his stage over to her during a concert. Like all A Star Is Born couples, Streisand and Kristofferson sell the romance, even as theirs frequently devolves to them rolling around on the ground and laughing—in the mud, in a bed with whipped cream, wherever. Streisand pays her own homage to Mason’s careful makeover of Garland in 1954 by painting makeup on the face of Kristofferson in the bathtub, a nice shift to feminine power. Cooper picks up that homage, as Ally does the same thing to Jackson in their bathtub. And that’s not the only parallel across decades: Watching these films back-to-back, it’s surprising how much of the overall structure is absolutely intact, like tracings of a drawing you could lay over each other. It’s not Gus Van Sant Psycho-level, but when a scene works, it works, in 1937 or 1976. Some edits act as connective tissues between the four films: 1937’s group effort to transform “Esther Victoria Blodgett” into the stage name “Vicki Lester” morphs into Garland picking up her new name with her studio paycheck in 1954, to Streisand’s Esther Hoffman refusing to change her name at all, while Gaga’s Ally gets a whole new name entirely. The consistencies are significant: like the couple eloping, or the awards show scene in which the husband destroys his wife’s victory speech by showing up drunk in the middle of it (although Jackson peeing himself on national television adds a considerable amount of horror), or the importance of the “I just wanted one more look” line, which occurs in all four movies. (The 2018 one is already a meme.) The men all say it to the woman twice: Norman, Norman, and Jackson the first time they meet their future wife; John Norman when Esther’s on her way to film a TV special. The final time he says it is the last time they’ll see each other, right before his death, so that Streisand’s Esther ends her movie with a song called “With One More Look At You,” an anguished showstopper that shows her vocal power. 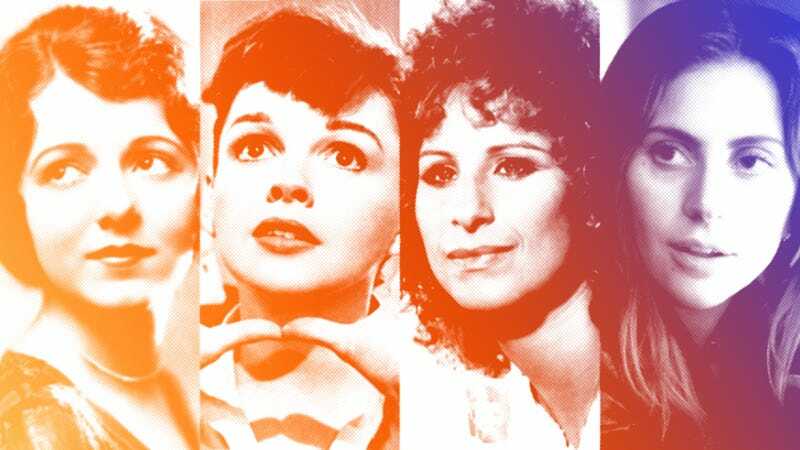 You can even break down the Star Is Borns into parallel pairs, with winning winsome brunettes Gaynor and Garland of the Hollywood movie-focused versions, and the “unconventional” beauty (unconventional only by insane Hollywood standards) of the immensely talented pop idols Streisand and Gaga. Through Streisand’s own involvement, her 1970s feminist Esther offers us an anger the earlier versions did not. Gaynor and Garland’s Esthers are supportive and placating, weakly smiling even as Norman accidentally smacks his wife across the face onstage at a public event. While previous Esthers only reveal their resentment to friend Oliver, the supportive studio head, Streisand’s Esther is understandably furious, screaming at her husband to fight his addiction, to fight for her, instead of letting his alcoholism rob them of every shred of happiness they’ve been able to salvage. And Ally and Jackson are on even more of an equal-level playing field as they actually engage in a vicious argument, the most venom exhibited of any Star Is Born pairing, after she comes home to find him drunk in the morning. For all its talk of stardom, and the considerable emphasis on romance, A Star Is Born is also a story rooted in addiction, as much as The Lost Weekend or Days Of Wine And Roses. Bradley Cooper, who worked on the screenplay and makes his directorial debut with this movie, understands this. Cooper uses all of the previous A Star Is Born movies as a framework, with all the various screenwriters (including Moss Hart, Joan Didion, and John Gregory Dunne) in the credits. He then adds so much to that framework, fleshing it out for a now more-sophisticated audience, which is why Cooper has audiences sobbing in theaters all over the country. There’s no specific reason why the male character is so troubled in past iterations, for example. Jackson’s backstory fills in a lot of the questions we have on why he is the way he is. The first three A Star Is Borns begin with the Norman character a star in free-fall. Cooper’s Jackson does drugs and drinks too much at the beginning of the film, but it’s also Ally who gets in a bar fight, not him. He’s still in control enough to be able to take care of her after her injury. But soon enough, we see him passing out on the floor and learn about tinnitus and a dysfunctional childhood, contributing factors to his alcoholism. Also, Cooper’s theories on fame and celebrity take important turns from the original story. The three Esthers and Normans wanted to be stars because they just wanted to be stars. But Jackson talks a lot about how important it is to have something to say, to an audience that wants to hear it. When Ally’s celebrity becomes a shallow parody of Lady Gaga’s own, with pop songs sporting meaningless lyrics instead of the poetry she’s capable of, it’s even harder for Jackson, because he feels like he should have steered her more. Unlike the Esthers, Ally is not as ambitious when her story starts, and the beginning of her career is closely intertwined with her eventual husband’s. She’s also the only female Star Is Born character who loses herself and her own authenticity (as she puts it, “what makes me talented”) to her fame, unfamiliar in orange hair and supported by backup dancers. Jackson continually cautions how easy it is to get caught up in things that don’t matter, and Ally only really becomes true to herself again in an homage to him after his death. While the new star’s fame appears to hasten her husband’s demise, in reality, he was already headed down when they first meet. In fact, maybe her love holds off his eventual destruction for a few more years, offering a glimpse of happiness that’s all the more devastating due to how golden—and brief—it is. A sober Norman or John or Jackson, in the various talented actors’ portrayals, is a dream husband: experienced, supportive, and devoted to his wife. The drunken husband who ruins his wife’s big moment on Oscar night is the polar opposite, as is Jackson, who tells his wife she’s ugly. In the Garland version, Esther’s dressing-room breakdown over Norman’s alcoholism to studio chief Oliver is especially painful, paralleling Garland’s own lifelong addiction issues that would lead to her early death at the age of 47. “Can you explain it to me, Oliver,” she sobs, “What is it that makes him want to destroy himself?” She could be demanding the same of herself. Of all the Star Is Born husband deaths, Jackson’s may be the most devastating. Unlike the Normans, who want to save their wife’s career, and John’s accidental drunken car crash, Jackson’s death seems to be more in defeat to his addiction, certain that what Ally’s manager Rez is saying is true, and that his relapse is just an inevitability. It’s a tragic end to a too-familiar tale: The destructive force of addiction ravages our relationships, our creativity, and our lives, turning fairy tales into nightmares. After Jackson’s death, and the requisite pep talk by his brother, Bobby (Sam Elliott), for her return to the stage, the brunette-again Ally gives a nod to 1937 and 1954 by announcing, “This is Ally Maine,” and to 1976 by going into a vocal performance. Like Streisand’s Esther, Ally uses a song of her husband’s to depict her feelings of loss. Streisand’s finale performance as Esther is a long, static head-and-shoulders shot, as Esther’s “With One More Look At You” vaults into her husband’s signature song “Watch Closely Now,” claiming it as her own. Ally’s “I’ll Never Love Again” ballad seems tragic until we get to view the spirit in which it was written by Jackson: She’ll never love again in that same way. Like all female protagonists of A Star Is Born, she carries the best of her lost husband inside her: Her success is not only her triumph, but his, and his legacy will continue as long as she keeps performing. The 2018 version of A Star Is Born shows how to “breathe new soul into an old Hollywood fable,” as our film critic A.A. Dowd put it, transforming the two-dimensional stiffness of the early Technicolor era into something breathtakingly honest and warm. It’s a classic story with many elements of myth, but Cooper improved on the preceding 1976 version with vulnerable performances and dialogue that seems almost improvisational, and more intimate. Many are rightly calling Lady Gaga a revelation as an actor, and pointing to Cooper’s own well-honed musical skills and devastating portrayal of both the sober and straight versions of Jackson (especially for someone who says he hasn’t had a drink since the age of 29). For Cooper’s directorial debut, and for Gaga’s first starring role, it was an ideal choice, despite how outlandish the announcement of this version may have seemed at first. It works so well that maybe we still haven’t seen the last A Star Is Born.